The inaugural lecture in the Luxembourg Society for Microbiology’s (LSfM) new lecture series ‘From Single Organisms to Systems Ecology and Evolution’ will take place on Wednesday, 6 February 2019. 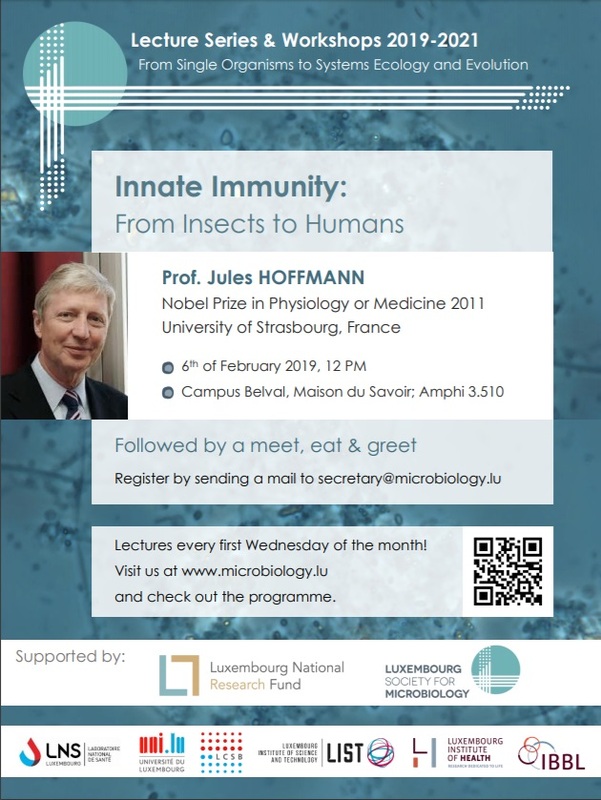 Nobel Prize winner Prof Jules Hoffmann will give a lecture on the topic ‘Innate Immunity: From Insects to Humans’. This lecture series is supported by the FNR’s RESCOM programme. The speaker, Luxembourg-born Prof Jules Hoffmann, received the 2011 Nobel Prize Winner in Physiology or Medicine. The lecture will be followed by a “meet, eat & greet” event for which registration is required. Please register by e-mail to secretary@microbiology.lu before 4 February.